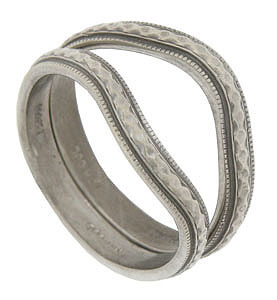 These 14K white gold stackable wedding bands are covered in an softened, engraved chain pattern. 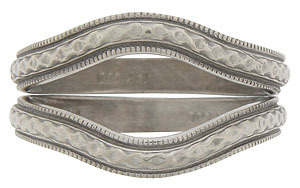 Deeply carved channels and milgrain frame the central design. The surface is darkened and burnished to add interest. Photographed with R609-Pl (sold separately) each band measures 2.83 mm in width. Size 7. We can re-size, or reorder in other sizes. 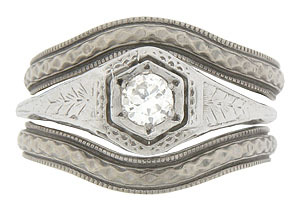 The bands are frequently purchased as a set for $620, but they can also be purchased individually.